News 2017-08-26: Check out the new version on Claude Heiland-Allen site and the new version of KeyFramesMovie64. The distance estimation coloring method is updated and KeyFramesMovie64 is improved with the alpha blend method. News 2017-04-06: Check out Kalles Fraktaler compiled with mingw and GMP by Claude Heiland-Allen. This version is serveral times faster on many locations! An example is stardust4ever's Magnum Opus Ex that is rendered in 3200x3200 in 12m21s in my version and 3m37s in Claude's, i.e. more than 3 times faster (and more than 11,000 times faster than stardust's original!). Also, the speed up for Newton-Raphson zooming is usually more than 10 times faster, so my recommendation is to use that program instead, if you are running on a 64-bit system. Mandelbrot fractals are fascinating both for the esthetic beauty and also because they are truly infinite. Recently a new method was developed to render Mandelbrot fractal images from a reference point rather than calculating the escape-speed for each pixel. Since lower precision then can be used, the time to render images decreases significantly. Compared with the fastest programs using the old method, this program is more than 100 times faster on zoom levels around e100! My humble thanks to K.I.Martin for sharing his mathematical findings, which I think is almost as big discovery as the Mandelbrot formula itself. My humble thanks also to Pauldelbrot for the solid glitch solving method which enables accurate render and make the new rendering method complete! Thanks also to Dikydau for the locations in the gallery and to those that have given feedback and suggestions. Thanks also to Botond Kósa and knighty for the extensions on Series Approximation. Thanks also to laser blaster for the Burning Ship perturbation formula. Update Version 2.10.1: A bunch of new fractals added, among them 4th and 5th power Burning Ship, Buffalo, Celtic, Mandelbar, Simon.snake's wonderful radiating formula, and many more! Store zoom-out images Zoom out automatically with the selected Zoom size and store jpeg image file and map file (*.kfb) for each zoom out. The zoom out stops when the depth is lower than 1. The resulting files can be used by the KeyFramMovie program to create a zoom-in animation. Save map Saves the current location in a map file (*.kfb). This file can be used by the KeyFramMovie program. Examine Zoom sequence Make sure you store the end location as a kfr file in the same directory as you store the zoom sequence frames. This function allows you to examine the frames one by one and add references to remove eventual visible glitch blobs, or choose another pixel as the main reference. Resume Zoom sequence Make sure you store the end location as a kfr file in the same directory as you store the zoom sequence frames. This function allows you to resume and continue the zoom out sequnce, if it got interrupted. Location... Displays the Location dialog where the coordinates for this location is displayed and can be edited. Iterations... Displays the Iterations dialog where the maximum iteration number for this location is displayed and can be edited. The smooth color transition method is also set here, and the power on the Mandelbrot function. The fractal types is also set here - Mandelbrot, Burning Ship, Buffalo or Celtic. Set colors... Displays the Number of colors dialog where the colors can be edited. Find Minibrot Starts an automatic zoom-in in the image's pattern center, until a Minibrot is found or if it fails to find the center. Set window size Set the size of the display window. Set main reference Let you click the image and select the main reference for the whole image. This can be useful when glitches appears on top of minibrots when the reference is outside this minibrot. The glitch pattern disappears from the minibrot if the main reference is selected inside the minibrot. No approximation Turns the Series approximation function on or off. Use auto iterations Turns automatic iteration control on or off. This is on per default. Set Ratio Enables chaning the ratio between height and width of the background image in order to enable stretching locations. Combinated with rotation, an almost infinite skewing ability is enabled, useful when exploring the hidden treasures of the new Fractals! Newton-Raphson zooming When activated, a dialog will be displayed, which allows you to select if the zoom should jump directly to the minibrot, or to 3/4 zooms to the minibrot, where the current pattern is doubled. Number of key colors Set the number of key colors between 1 and 1024. Random Fill the palette with random colors made from the Seed value. The Seed button select a seed value randomly. Show slopes Enable slope encoding for 3D effect. First value is the magnification of the slopes. The start value of 100 is suitable for the unzoomed view. Deep views requires a couple of magnitudes higher value. The second value is the percentage with which the slope encoding is applied on the coloring. 100 is max, however flat areas will still have the palette color visible. Palette waves The palette can be filled from sine waves applied on Red, Green, Blue and Black-and-white. Each input box specifies the number of periods applied on the number of key colors in the palette. If the input box is left empty, no wave of this color is applied. At right of each input box the "P"-button makes the number you entered prime, since different prime numbers probably give more variation. The last input box specifies the waves offset. A negative value on Hue, Saturation or Brightness makes a flat percentage value to be applied on all iterations. Speed control The number of frames in the movie can set for each key frame. The zoom movie will start from the last, most zoom out, image, which will have number zero. The Frame num button can be used to get help in selecting the key frame. Color cycle control The change of the color index for each movie frame in the movie can be set for each key frame. This is set with a float value, which can be negative. If the list is left empty no cycling will be performed. 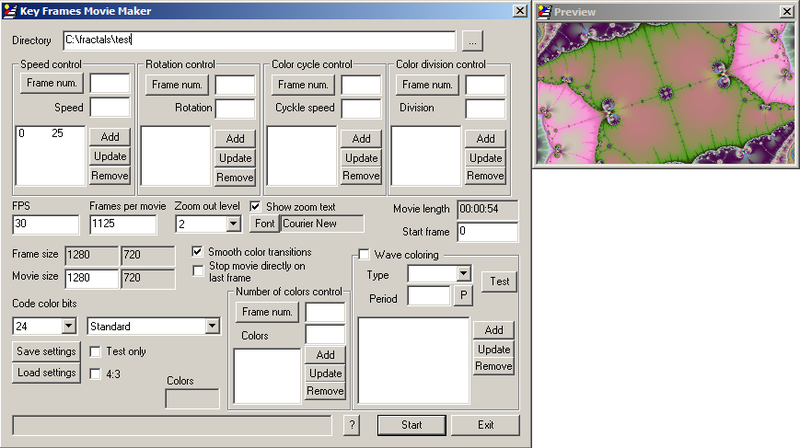 Color division control The value of the color division can be set for each key frame. This can be set with a float value. If the list is left empty the division value from the zoom sequence is used. The iteration division value is changed smoothly in a logarithmic way. Note that very small changes can cause chaotic changes in the movie. Number of colors control The number of colors can be set for each key frame. Decreasing the number of key colors can reveal dense patterns in a more smooth way than changing the color division. Wave coloring This is the same function as "Infinite waves". The infinite waves are not read from the KFB frames, so it must entered again in this program. The ability to quickly test the parameters is enabled with the "Test" button. Long waves Sine waves of any color can be applied on the frames, mainly to emphasize the final minibrot. The color is only applied every second of the sine period. Start frame The start frame of the movie can be specified. This is applied when creating the movie, when testing with the check box "Test only" is set, or to test single frames with the "Test" button.